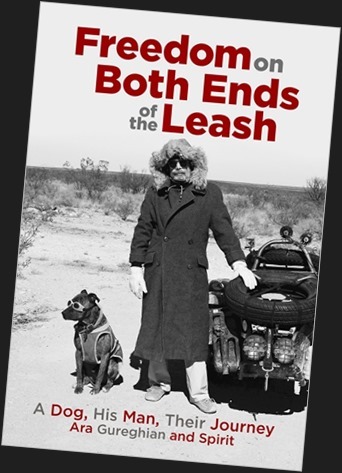 “Freedom on Both Ends of the Leash”, our Book, is now available autographed through us for $24.99 [$19.99 + $5 S&H, Continental 48 States] by clicking the photo links on top of this page. [PayPal accepting all cards]. It is also available through Amazon in paperback or as a Kindle download. All other electronic formats are also available. You can also order from any Bookstore and Beemerboneyard. If ordering more than one copy through us you will need to place each order separately or e-mail me. The flat shipping rate for outside the 48 States or International is $15. Please e-mail me [“e-mail me” link above] for those orders as you will have to get directly into our PayPal account bypassing the normal procedure. It has been and still is a rough week. It really should not but it happens. Bad back from moving tiles not allowing us to ride after a visit to the emergency room thinking it could be my kidneys, Holiday blues, absent family, this too shall pass. I did write though, did not take any photos this week, one only, and I find it a propos to not mix in what follows with pictures. Who knows, it might help one or two others reading this. "A distressing emotion aroused by impending danger, evil, pain, etc., whether the threat is real or imagined; the feeling or condition of being afraid." "Something that causes feelings of dread or apprehension; something a person is afraid of." I just finished watching a full length movie made by some good friends. It is not public yet but they have been kind enough to send me a private link. The actor, the movie being a monologue which will keep you riveted to your seat for an hour and a half, talks, amongst other aspects, mainly about a void of Life he never told his Son who had passed away. "Fear…". Fear which is within everyone. It has left me confused and trying to sort it all out. The story is fictional which makes me wonder even more of the reality of such concept. Do you have fear? Are you afraid? Way deep down… somewhere hidden and not letting anyone know or talk about it? A taboo subject? Did I have fear in years past before Lance passed away? Probably. I do not today. I don’t think so. Is it the result of having dealt with the worse card in this game of Life? Losing one’s only Child? Probably. I had no fear when Spirit and I just left a bit over eight years ago with whatever we could carry on our motorcycle and sidecar. When one has already lost it all, what else is there to lose? It is a saying that still follows me daily. A few days have past and I am still thinking about it. 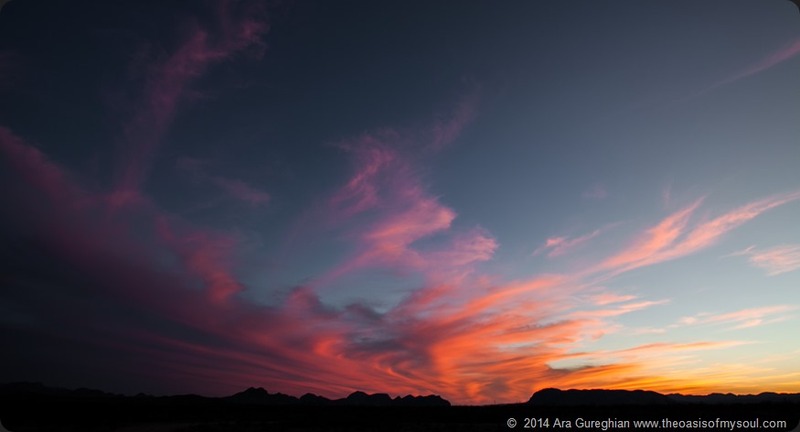 In this desolate Desert thoughts do flourish and take a Life of their own. I realize, still baffled, that I was wrong. I do have fear. I have the fear of losing Spirit which I know will happen some day. It is reality. I also have the worse fear of them all which is to Love. The real Love towards a person, meaning a deep relationship, a Lifetime one. I do Love my Friends, Mother Nature, good food, riding, photography, writing and more, but that true Love scares me, puts fear in me, the fear of, if it ever happened, losing again a true Love. It is not like I meet a possible companion everyday on this path of ours, but the anticipation of the possibility of losing a true Love has instated a fear in me. So much for living in the now. And then, me who always said and maybe expressed too strongly the downfalls of the "fear of the fear", realize I do have it also as it is a deep feeling I do not want to experience again. I have felt it too many times. The only satisfaction I have after all these years is having found out that the questions do not have any answers. It is not a great satisfaction as it demands much acceptance and I cannot be blind to a faith and often just accept what is presented in front me. I need proof. I need sight, touch and tell. All so void from many of this world’s beliefs. I know this too shall pass. It is the ramifications of thinking about one subject I was exposed to. There is no harm but only thoughts that maybe something good will come out of it. Fear turns out to be such a powerful aspect of Life so few talk or want to talk about. They are afraid of it as I find a difference in their definition between fear and being afraid. That nuance is hard to explain yet for me. The layers which we see and read daily on those Internet pages have been painted on to hide what is truly inside of us. What I myself write on these pages because they are mine truly have no aspect of hiding any deeper layers. As different as we each are, we are still the same. I have never had the fear "here" of saying it the way it is because they are and have been since day one conversations with myself. Anxiety, concern, despair, dismay, doubt, dread, horror, jitters, panic, scare, suspicion, terror, unease, uneasiness, worry, agitation, aversion, distress, fright, misgiving, nightmare, phobia, presentiment, qualm, revulsion, timidity, trembling, tremor, trepidation, cold feet, cold sweat and so much more are indeed synonyms of fear. What an irony thinking I had no fear as maybe so many others feel as such as it does play such a big role in everyone’s life. Their antonyms are assurance, calmness, cheer, confidence, contentment, ease, encouragement, faith, happiness, joy, trust, calm, comfort, like, liking, love, bravery, courage, heroism, aspects so much easier to show holding high up written on banners we daily parade. We could say that "in the beginning" things were going along quite well, at some point, however, there was a loss of confidence in the way things were going. “Are going” as, maybe at the most once a week I look at headline news and I so much feel this world has become insane. Just my opinion. There is a kind of a primordial panic which is producing confusion about its happening. Rather than acknowledging this loss of confidence, there is an identification with a deep panic and confusion. Ego has surfaced and began to form. Ego which one might think will hide fear but does not when one truly seeks deeper into all of this meaning. Ego: the conscious mind, based on perception of the environment from birth onwards: responsible for modifying the antisocial instincts of the id and itself modified by the conscience. Ego, the part of the psychic apparatus that experiences and reacts to the outside world and thus mediates between the primitive drives of the id and the demands of the social and physical environment, has mostly taken over. It likes the situation because it fuels itself, it is an easy path that blossoms rapidly. It is a craving that consumes the situation, it is endless, it is consumer oriented, it is the "Chrome Hummer Syndrome". It makes us want everything to be predictable, easy, purchasable. When its novelty fades how easy it is to move on to a shinier and faster product. It brings on an aspect of aggression as we want more and more. We are so busy fighting that we can’t find an alternative to fighting; the possibility of an alternative never even occurs to us. Jealousy appears, a pattern of existence characterized by acute paranoia. We become always concerned with "making it". Everything is seen from a competitive point of view. We are always trying to score points and trying to prevent others from scoring on us. If someone achieves something special we become determined to out do them. We never trust anyone; we "know" they’re trying to slip one past us. If someone tries to help us, we try to figure out their angle. If someone doesn’t try to help us, they are being uncooperative, and we make a note to ourselves that we will get even later. "Don’t get mad, get even," that becomes our motto. These are all aspects to again hide "fear". What could be the path to liberation from these miserable states of being, the right way to view the world. Wrong view occurs when we impose our expectations onto things; expectations about how we hope things will be, or about how we are afraid things might be. Right view occurs when we see things simply. As they are. It is an open and accommodating attitude. We abandon hope and fear and take joy in a simple straight-forward approach to life. We could then proceed from this right view. If we are able to abandon our expectations, our hopes and fears, we would no longer need to be manipulative. We would not have to try to con situations into our preconceived notions of how they should be. We work with what is, with pure intentions. Once our intentions are pure, we no longer have to be embarrassed about our speech. Since we aren’t trying to manipulate people, we don’t have to be hesitant about what we say, nor do we need to try bluff our way through a conversation with any sort of phony confidence. We say what needs to be said, very simply in a genuine way because this involves a kind of renunciation. We need to give up our tendency to complicate issues. We practice simplicity. We have a simple straight-forward relationship with our dinner, our job, our house and our family and friends. We give up all the unnecessary and frivolous complications that we usually try to cloud our relationships with. It becomes only natural and right that we should earn our living. Often, many of us don’t particularly enjoy our jobs. We can’t wait to get home from work and begrudge the amount of time that our job takes away from our enjoyment of the good life. Perhaps, we might wish we had a more glamorous job. We don’t feel that our job in a factory or office is in keeping with the image we want to project. The truth is, that we should be glad of our job, whatever it is. We should form a simple relationship with it. We need to perform it properly, with attention to detail. All of this demands right effort. Wrong effort is struggle. We often approach a spiritual discipline as though we need to conquer our evil side and promote our good side. We are locked in combat with ourselves and try to obliterate the tiniest negative tendency. Right effort doesn’t involve struggle at all. When we see things as they are, we can work with them, gently and without any kind of aggression whatsoever involving precision and clarity. We are mindful of the tiniest details of our experience. We are mindful of the way we talk, the way we perform our jobs, our posture, our attitude toward our friends and family. Every detail. All of this with the right concentration, or absorption. Usually we are absorbed in absentmindedness. Our minds are completely captivated by all sorts of entertainment and speculations. Right absorption means that we are completely absorbed in nowness, in things as they are. This can only happen if we have some sort of discipline, such as meditation, a hike within Mother Nature, the sight of a Sunset or Sunrise. We might even say that without the discipline of meditation we cannot cut through our absentmindedness. It provides a space or gap in our preoccupation with ourselves. I think I am done for today!